This paper looks at the changing role of the EU-27-based multinational companies in the global economy as compared with the main regions of the world. It makes conclusions reflecting on the framework conditions of various global development scenarios defined in the framework an international research project of the Seventh Framework Programme of the EU, ‘AUGUR’ (http://www.augurproject.eu/). 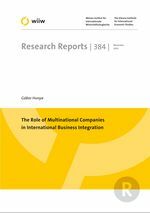 First we summarize the findings of recent research on corporate internationalization and international sourcing strategies. Then we turn to the analysis of FDI balance of payments statistics, mainly change in stocks by main regions and by main economic activities. We distinguish between the two main forms of foreign market entry of investors, M&A and greenfield investments. For greenfield investment projects we keep track of the number of investment projects, investment value and business activity. Based on available data we prepared a ten-year projection for the 2010s revealing possible future shifts in the power relations between various parts of the world in terms of FDI and corporate development. The findings are summarized based on four different international integration scenarios prepared in the framework of the AUGUR project.